It's amazing the simple things that make me happy. I was at my weekly 'koffee klatch' debrief and came across a new line of cookies. 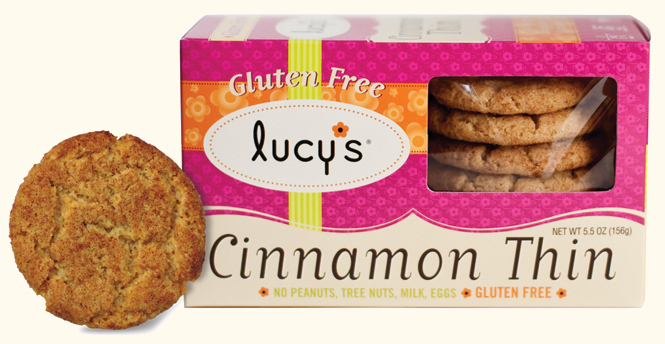 Dr. Lucy's is a brand I'm happy to promote. It is free of the following allergens: gluten, milk, eggs, peanuts and tree nuts. They are kosher and CERTIFIED VEGAN by vegan.org. Are you the leader of a support group helping people with food allergies? Dr. Lucy will provide you with free samples for one of your upcoming meetings. There are many varieties to choose from including Sugar, Cinnamon Thin, Oatmeal and Chocolate Chip. I found them at Starbucks. It's nice to have a 'sweet' alternative for anyone who can't have anything else there except the oatmeal. Want to find out more? Visit http://www.drlucys.com/ . As good as they are, I was happy to hear that the cookies I make at home still taste better.